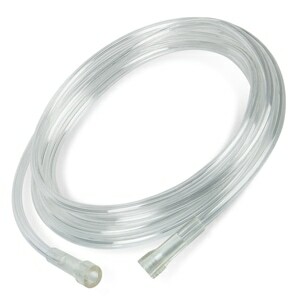 The SofTech's Star Lumen Supply Tube is crush and kink-resistant and includes a standard connector for easy attachement to standard oxygen tubing. The over-the-ear design provides a comfortable and secure fit. Doesn't cut into my nose since it is not latex. Really like the soft-tech cannula, very soft and light weight. Does not weigh on the ears. I ordered 4 fot tubing with soft tip and got 7 foot tubing with regular tips instead. Other than that, I was well satisfied. The ordering process went well. Perhaps I should have taken advantage of chat mode to clarify what I was looking for. Its my fault, so I will just live with it. I can use these for my floor model concentrator. I was ordering the 4 foot ones for my portable concentrator. I made the mistake so I suffer the consequences. I will be more cardeful in the future. Good product, although it crimps easily. A very good cannula: Delivers the oxygen quietly and efficiently. The extra long nasal portion gives extra comfort to the nose area. I had previously ordered a 4 foot nasal SOFT canula for my wifes portable oxygen concentrator. The tube that goes on the face and in the nose was VERY soft. I tried to order a 7 foot canula and it was not the same as the 4 foot one. She is not happy with it. Maybe I misread a part of the description, I don't know. 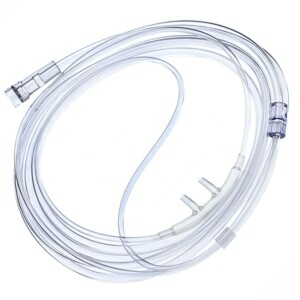 This cannula is excellent.Very light weight and more flexible than those from my previous supplier. 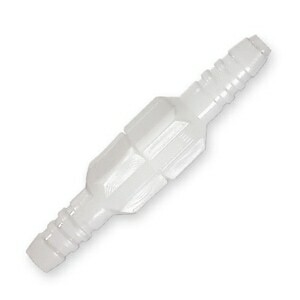 This is a great cannula, not too soft & not too hard. But my main point is that Direct Home Medical always has a great selection of products at the best prices and ships fast! Could not be a more loyal customer. They were just what we were looking for, we use to be able to get them thru our home health care office, but they stopped carrying them and only had the 4foot ones. I was used to a little more expensive cannula and wish I had spent the extra money. While these work okay, they weren't a perfect fit with the Salter cord and I had to cut the nose prongs down, which I would prefer not to have to do. I was expecting the nose piece as well as the part that lies on my face and goes around my ears to all be soft. However only the nose piece is soft. It also fits large on my face. I'm sure as function goes, it is fine. But it is not what I am looking for and not what it is described to be. I need to ask for more details I guess. I just started using this stuff so I am learning as I go. Spend the extra money and get the type that is flexible. These are not flexible and by end of day I had to go back to the ones given to me from oxygen company. They are hard and press so it really makes under your nose ache. I still have to figure out what to buy. THE CONNULAS THAT I RECEIVED IS NOT WHAT I EXPECTED. 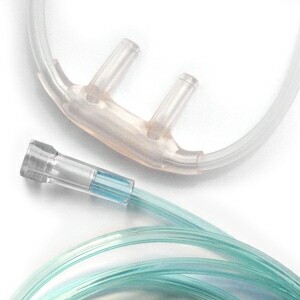 THE ONLY THING SOFT IS THE NASUL PIECE.THE HOSE IS TO STIFF, AND THE OVER THE EAR HOSE IS STIFF AND NOT FLEXIBLE AND IRRITATING.IT ALSO COMES OFF THE EAR WHEN YOU DO NOT EXPECT IT TO. The product ordered is very good and the oxygen user in our home states the nasal cannulas are comfortable and stay in place nicely during the night. The Customer service is excellent! You can count on my business!!!!! These are the softest and so much easier on the under nose area. No more sores from hard vinyl/plastic. And no little "plate" type thing to go against the "under nose area". Love these, and when I need more, these are what I will order. Thanks to the manufacturer. These soft cannulas make such a difference using my oxygen. So much more comfortable than what is supplied by my oxygen company. Very good item. Will definitely buy again. Just wish they came with Earmates attached. I ordered several 4' and several 7' of these as they are the most comfortable for me. The product is good and the service was fast. I recommend both when you need supplies. very soft, the perfect choice for my mother! Length is great. Tubing is softer than most. But the nasal prongs are a bit large and "clunky". Tubing is a little stiff but for the price cant beat it. Quality and comfort at a great price. Cannulas were received in a few short days and were packaged very well. The cannula itself is softer than the ones I had been using, so they get a High-5 from me. Comfort is everything! My Pulmonary Specialist wants me to change canulas every two weeks. My Pulmonary provider will only provide two per month per Medicare. Now I have a reliable, affordable source. Thank you. Much softer than what we had. Better to put on too. I always get exactly what I want at a reasonable price. Will continue to order from Direct. Thought the order was for the softech materail to go around the ears, etc... from the splitter - this was only the softech material that goes into the nasal passage. Very comfortable compared to the cannula provided by my DME supplier. I found them to be exatly what I wanted and very easy to use. I will be ordering more. I am very pleased with this cannula and will continue to purchase them here. Tubing is perfectly satisfactory. Quick Delivery, good service. Will order from you again. I don't have to soften a hose any longer in warm water in order to connect it to my walker-cylinder. These are ready to go. The next order, I will order a 4' and not a 7' I found the 7' is a little too long for me to use. This cannula was one of several different brands and styles I purchased to test and find the best fit and softness. Nasal lumens can be cut to size, but some brands have a better initial size than others. This Hudson Ref. 1820 cannula came out of the package soft and flexible. The nasal lumens were a good length without requiring trimming down. The tubing is comfortable over the face and ears. I would recommend this product, and I found it recommended on various other sites as the best cannula available. There is a slightly higher price for the Hudsons, but that, like everything else in life, is because it is a superior product. Received order in a timely manner. Very satisfied with this cannula, it's very comfortable during the night, which is when I use my oxygen concentrator..
After suffering with nose irration caused by other cannulas; the Softech nasal cannula is a dream come true. I had been getting my cannulas thru a provider for the local VA Hospital. One out of five would work but it was obvious that they were all cutrate. The ones I got from DHM are soft at the nose which is my primary concern and consistant in quality. I'll order mine from DHM, but will show them to the providers at the VA Hospital, here in West Palm Beach.